Right across Ibn Nouf Street lived a leading member of Egypt's Coptic politicians. This was the residence of Wafdist Foreign Minister Wassef Boutros Ghali (son of a former prime minister and uncle of the incumbent UN secretary-general) and his French wife. Known to society as 'Tante Louise' Mrs Wassef Ghali was actually born Louise Majorelle, a name wrongly associated with the Majorelle furniture design. In fact, Louise Ghali belonged to the silk Majorelles of Lyons. When Wassef and Louise Ghali purchased this piece of prime Giza property in 1919 Egypt was still a British Protectorate in a state of fiery political upheaval. Amongst those the British jailed in 1919 were the nuclei of the future Wafd Party including Ghali. That is perhaps why the property was purchased by default in Louise Majorelle's name and why, forty five years later, it was her heirs and not her late husband's, who inherited the property. The Wassef Ghalis had no children of their own. It was Louise who picked her new home's designer-architect, Signor Domenico Limongelli. Through his wife Kitty, a daughter of Artin Pasha an Armenian-Egyptian with considerable connections, Limongelli landed himself several contracts with the extended Ghali family, one of whom had also married a high born Armenian. Another Limongelli creation in Giza is the twin set of elegant apartment buildings on Bahy al-Din Barakat Street which intersects with Avenue al-Nil at its southernmost tip. The Wassef Ghali homestead consisted of one floor and an elevated basement. While the roof harbored a tiny room for Grandma Majorelle (Louise's mother), the basement was where the Ghalis kept a precious collection of carpets along with two relic taxis de la Marne --leftovers from the Great War. Several historic meetings took place at Ghali House during the interwar period such as those which dealt with the formation of the nationalist Wafd Party in which the Copts played such a prominent and constructive role. Understandably, it was in Ghali's Giza residence where in January 1928 the Wafd caucus endorsed Mustafa al-Nahas Pasha as the new party boss following the unexpected death of Saad Zaghloul the previous summer. The Ghalis liked to summer in France where they owned a house at La Prieuré near St. Rémy les Chevreuses. It was also in France that Wassef Ghali Pasha died in November 1957. Louise followed him a few years later, about the time when Egypt's landed aristocracy was sequestered and their property confiscated. As predators from the new regime were already circling around the Ghali property, Louise Majorelle's heirs heeded advice from their counsel Maitre Platon Valaskakis and sold the Giza property to the first cash-ready buyer. The French government having exercised its right of first refusal, the choice fell on the American State Department's offer of about L.E. 235,000. It was a decade later, during Nixon's epic June 1974 visit to Egypt, when the American administration in an act of largesse offered the former Ghali property to President Anwar al-Sadat, along with a US$ 2 million helicopter. But when Congress raised angry objections, the Americans withdrew their real estate offer leaving Sadat the chopper for his frequent travels. The Egyptian President's elaborate blueprints for his intended new house were reluctantly be shelved. The Americans then proceeded to replace Ghali's arabesque house with a colonial-type villa designed by Washington's Metcalf & Associates under the supervision of Washington's Federal Buildings Bureau. The local contractor was Galal al-Abd. The ambassadorial villa was to become the home of Alfred Leroy Atherton the then-US envoy to Egypt. But if one were to believe Washington gossip, the intended Nileside residence was unlivable, plagued with problems such as serious cost overruns a.k.a. hush money. The official version for not moving was that “the house was faulty and fell short of security requirements.” Those were the days America was recovering from Watergate. To avoid additional scandals, the house and land were put up for sale and the whole caboodle swept under the Foggy Bottom's carpet with a profit to boot. These were the speculative economic open door--infitah days when Cairo's real estate started its dizzying upwards spin." The first American couple in Egypt never moved to the empty house in Giza. Like their successors--Nicolas Veliotis, Frank G. Wisner II and Robert H. Pelletreau--Alfred and Betty Atherton remained at Zamalek's No. 10 Taha Hussein (ex-Willcocks) Street. The Edward Walkers (Ned and Wendy) were the first to live in the new residence located inside the American Embassy compound in Kasr al-Dubara (district now referred to as Garden City) in 1995. When the former Ghali property was auctioned off in the 1980s, it was picked up by eager Gulf-moneyed developers. The new owners razed the jinxed colonial villa in anticipation of building a multimillion complex presently under 24-hour construction. The new luxury twin tower is and undoubtedly will remain for years to come the subject of animated conversation: "Who, from among Egypt's rich-raff, new pashas and megabuck bellydancers will live there?" What we do know for the time being is that one of the towers is earmarked to become a five-star hotel. Next door to what used to be Wassef Ghali Pasha's villa is the French Embassy. This was once the mansion of Sinot Hanna Bey. Like Ghali, Hanna Bey was a founding member of the Wafd Party. He was also the long-time Coptic deputy from Assiout City. Three years after he died in July 1933, Sinot's heirs sold the house to the French Government which proceeded to refurbish it a la Francaise filling it with heirloom tapestries, china bone and Louis XVI. Thankfully, the two-acre garden needed no improvements. Khedive Ismail's trees, a legacy from his once famous botanical parks were still there. All that was missing was a chancellery. In 1937, French architects George Parcq and Jacques Hardy designed the new chancellery taking into account they would transpose therein antique pieces from the old downtown legation on Cherif Street. Hence, the massive door, the Great Hall's intricate wooden-worked walls and ceiling, the mosaics, the fountain, the potteries and the statuettes. Also imported from the old chancery were the marble columns and arabesque fountains. In a sense, the spirit and character of the old legation's Neo-Islamic character was reproduced in Giza. The end result was the resounding masterpiece located in the southwest corner of the embassy garden. Notwithstanding the one hundred embassies in Cairo, the French residence remains at top of the "most elegant" list its uniqueness matched only by the gracious hospitality of its sitting ambassador and his wife. Right across narrow Abou Shamar Street, overlooking the Nile and across the French embassy's southern perimeter stood the home of Coptic Wafdist finance minister, lawyer Kamel Sidki Pasha. Behind him lived court master of ceremonies, Ali Rachid Bey. Unlike Sidki's villa, which is now an apartment building, Rachid's house , survived, somewhat forlorn and neglected. Owning a Dahabia moored opposite Abou Shamar Street was Ragheb Hanna Bey, another Wafdist politician. One of the last survivors of this bloc is Villa Alhambra, the redbrick house of the much decorated Dr. Mohammed Sobhi Pasha, a prominent oculist in his day. His house No.6, Dr. Sobhi Street, is today owned by KREIC (Kuwait Real Estate Investment Consortium). With long-standing plans of an office-apartment high rise, the Kuwaiti company has purposefully left the property to decay inducing the collapse of its stately royal palms. Across Dr. Sobhi Street (No.1 ex-Zi Osbaa street) is a beautifully restored art-deco villa built by Michel Libermann whom we met earlier up the road. This house was once occupied by Shahin Pasha and Doctor Ahmed Deif. Its extraordinary high-reliefs alternating with trompe oeil windows are masterpieces in themselves. They depict a mixture of pharaonic motifs with a Mayan touch. The house was the scene of many a colorful receptions when in was leased to the Brazilian embassy in the '80s. Next door to the art deco villa, is Karma Ibn Hani, the Italianate villa of court poet laureate Ahmed Shawki (1868-1932). The character is typically "style Pasha," a rich bland of baroque with columns, thick cornices, balustrades and a typical twin-staired main entrance. Sometimes, this type of staircase would be substituted with a ramp so that the pasha could be driven right up to his front door. In this case, however, the poet laureate preferred to walk up. Although a low lying house, Karma Ibn Hani (now the Shawki Museum) and the Giza pyramids remained intervisible long after Shawki was gone. Everyone knew of the poet laureate's long-standing affair with the pyramids. Even when he lived in downtown Cairo, unable to spot the peaks of Chefren, Cheops and Mycerinos, Shawki would picnic on the Giza plateau almost every other week. By relocating to Giza in the mid-20s, Shawki no longer needed to travel up Pyramids Avenue. All it took was to open wide his upstairs windows and there they were, the three Giza in all their glory. In the back of the Shawki Museum stands another villa in the same style. No.6 Ahmed Shawki Street belonged to the poet's relatives the Alailis. Today the villa houses the offices of the Mexican embassy. Across the street and facing the Nile stands an art deco building built by the Elmi family who were also related to the Poet laureate through his wife. Either in this building, or in the one down from it at No.12, lived international movie director Togo Mizrahi and his wife Myriam Donato. Behind No. 12 is yet another art deco building built in 1931 by Italian architect Guido Gavassi. Today it is the Cote d'Ivoire Embassy. And right next door to it at No.8 al-Hasn Street, is the former home of banker Levo Perez. At No.3 Road al-Hasn (now Pakistan Street) stood the palace of Princess Khadiga. A daughter of Khedive Tewfik, Princess Khadiga was the next to youngest sister of Khedive Abbas Hilmi II in whose honor the nearby bridge was named after. Married to Prince Mohammed Abbas Halim, both a cousin and former Governor of Turkey's ancient capital of Borsa, Princess Khadiga had six daughters and countless grandchildren so that her Giza residence never lacked wedding celebrations. One of the last ones was that of her granddaughter Princess Seljuk Sultan to the debonair Egyptian dandy Gazouli Rateb Bey. In the wake of the 1952 coup, the palace was transformed into a secondary level school and subsequently pulled down. All that remains of the palace today is the old coach house and a few thirsty palm trees. Closer to Giza Bridge (ex-Abbas), is 'Ghaliland' so named because the Ghali family, whom we met earlier, owned a sizable portion of this Nile frontage. They could have owned it all had it not been for the two arabesque villas standing in the middle. The architect of both these interesting villas was Mario Rossi whose other works include the mosques of Sidi Morsi Abu al-Abbas in Alexandria and Omar Makram in Cairo. Aside from its remarkable architecture and its thematic salons, Villa Barakat should have been listed because it was in its inner courtyard, probably around the fountain, that Egypt's intelligentsia debated the early drafts of Egypt's landmark Anglo-Egyptian Treaty before its 1936 ratification in both London and Abdin Palace. In its last years, before it transmogrified into a skyscraper, Villa Barakat was leased to a director of the Chase Manhattan Bank. Knowing it would someday go, one wonders if the banker kept as a souvenir the stylised eyes of Horus which were used as door handles to the pharaonic salon. Villa Afifi, on the other hand, was spared destruction. Its wonderful ceramic interiors and its imposing arabesque portal are still there, gasping for light, squashed between two apartment blocs. Serving as a residence for Dutch ambassadors in the 1960s and 70s, it is today leased out by Nasser Bank to the producers of Vitrac jam. At the tip of Giza's riverside drive stands an imposing modern building just before you arrive to the Giza bridge underpass. This is one of two Ghali buildings in the area. This one however was designed by one of its current owners Michel Boutros Ghali. Both Michel and his two brothers, Raouf and Boutros Boutros-Ghali still live there, the latter occupying the penthouse. Despite the defensive mashrabiya barriers, Boutros's upper penthouse looks like a cat copulating with a giraffe for the former UN secretary-general's terrace is now stuck to a towering glass and aluminum complex built by the Ministry of Foreign Affairs Housing Association. This 'too-close-for-comfort' situation prompted many unsympathetic remarks from environmentalists one of which being "E tu, Butrus?" Did the former UN secretary general, who would one day head the Rio Summit on Environment, really need to sanction the sale of the tiny Ghali-owned plot of land on which the new tower was built. Does profit always have to come before other considerations? Shame on you Mr. Ghali! Lesser homes have been classified or listed elsewhere in the world, yet in Egypt we are first hand witnesses to the wanton destruction of irreplaceable edifices, mansions and statues built for and by our former leaders and notables. Thank God, therefore, for the three villas on Giza's riverside drive that received a new lease on life: Karma Ibn Hani, the Mubarak Giza Public Library and the Mohammed Mahmoud Khalil Museum. They may be all that is left as we enter the next century; three lonely testimonials of what was once Giza's elegant riverside drive. With regards the art-deco villa you refer to as having belonged to Dr. Ahmed Deif, I would like to share with you its history. The villa was built by my mother's aunt, Siadat Sayed Bahnas. It is there that she lived with her first husband Mahmoud Shahin. Together they purchased the furniture from Krieger in Paris. When Shahin died, my great-aunt remarried Dr Ahmed Deif. Because Siadat died childless the villa passed on to my mother and her brothers. For a time it was leased to the Embassy of Jordan. Much later a maternal uncle of mine sold it to a Palestinian for the sum of LE 80,000, but after a three-year pre-emption legal battle the villa was taken over by the Ibrashi-Barakat family who owned the nextdoor building. Just to add an extra touch to a perfect piece of work, you may want to know that Aly Rachid, mentioned in the episode, bore the title quot;Pasha", rather than "Bey. He was given the title on November 19th, 1949. Further, Bahy El Din Barakat Pasha was characterized as a wafdist. In fact he left El Wafd in 1932 along with his father Fathallah Pasha Barakat and six other prominent politicians. Bahy El Din Pasha remained independent from parties since then, although with a known inclination towards " El- Ahrar El- Dostoorien" party. Similarly, although Ragheb Hanna Bey was a wafdist at one point, he later left El Wafd and joined "El Saadyeen", where he was appointed as state minister in the governments headed by Saadyeen consecutive leaders, Ahmed Maher Pasha and Mahmoud El Nokrashy Pasha. The Nile dahabia of Ragheb Hanna, named "Aida" was moved in the early forties from Giza to Gabalaya Street in Zamalek, facing Gezira club. Princess Khadija Tawfik had six daughters Wegdan Neshine married to Nagi Aali Bey, Halima Fatma married to Osman Fouad in 1920, divorced in 1932 and remarried to Prince Youssef Kamal for a few months in 1937. Amina Panba married a Abdel Rahim Affendi in 1919, divorced in 1923, married Kamal El Din Samy Pasha in 1925 then afterwards Prince Omar Halim. The fourth was Tawfika Hameda who married Abbas Galal in 1919, fifth was Neimet who married Ahmed Galal in 1931 and sixth and last was Zienab Marzouka who married Ehsan Mohsen for nearly a year in 1931. I could not find Seljuk Sultan and Rateb Ghazouli. 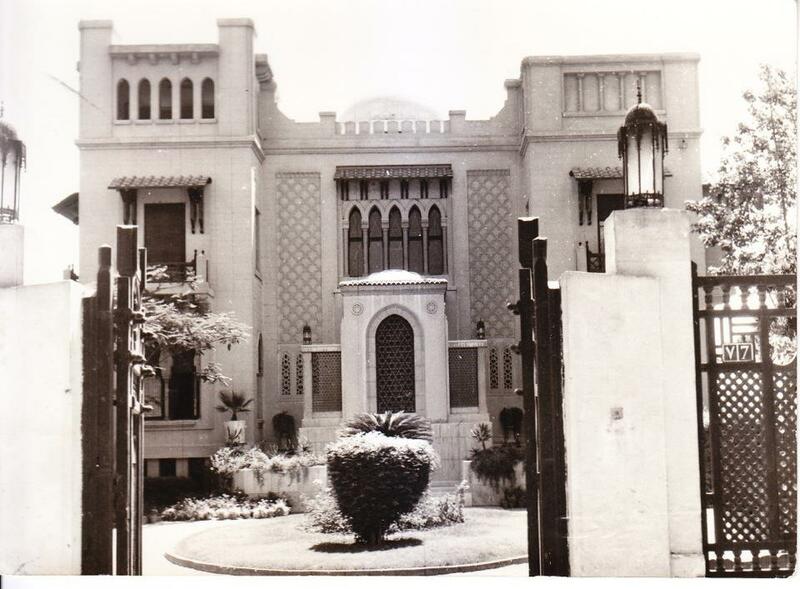 As for Princess Khadija herself, she moved out of the house on the Nile in 1945-1946 to Ibrahim Pasha Street in Helwan. She died shortly before 1952 coupe (1950-1951). Last we arrive to Princess Houria Mahmoud Hamdy and her noisy neighbor Mohamed Sultan. He was a nephew to Madame Hoda Sha'arawi, being the son of her brother Omar Pasha Sha'arawi. He himself also bore the Pasha title, given to him on May 6th 1951. As for the house of Princess Houria Mahmoud Hamdy and her stepdaughter Mounira, it still exists. You can find at the corner of the Mahmoud Hamdy and Giza streets, turned into a public school. It is in a relatively fair condition, enjoying a recent exterior painting, though almost turning blue in suffocation from two imposing ugly buildings squeezed on both sides of the garden to cater for the infinite number of students it is required to accommodate!